Club Penguin Cheats by Mimo777 Club Penguin Cheats by Mimo777: Club Penguin Golden Code Card FAIL! Okay, I am lovin' Card Jitsu Water! How 'bout you? I do have a HUGE complaint, though! "Enter this code to jump 1 level or add new cards online!" Knowing this card would help me "jump 1 level," I decided to wait to enter the code until I was finished earning my Torrent Mask on level 3. Do you see that? "Jump 1 Level" of Card Jitsu FIRE!! Wha? Get outa here!! I am already a Fire Ninja! Of course, I tried to click it but it wouldn't let me choose it. I had no choice but to unlock 6 cards. 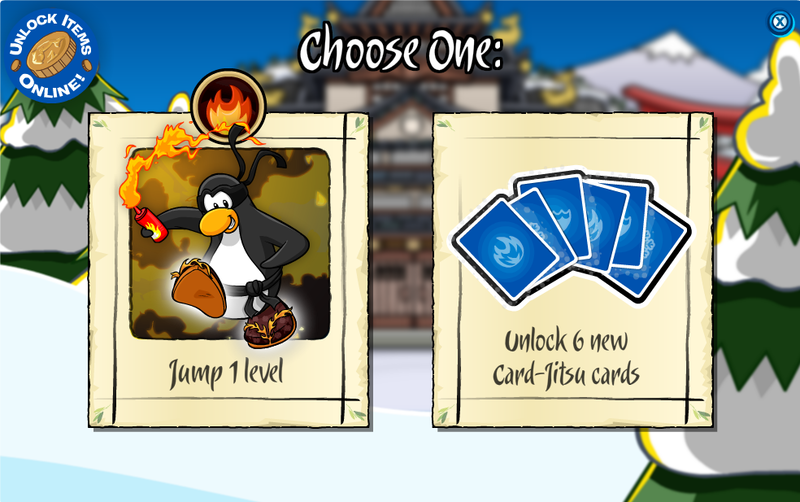 How can Club Penguin put this Fire card in a set of Card Jitsu Water cards? Did you get a Golden Code Card? Were you able to "Jump 1 level"? Can't wait to hear how you are doing on this new game! UPDATE: I contacted Club Penguin about this and they removed the 6 new cards and let me "jump 1 level! Woot! Club Penguin, you rock! Mimo I got cards and one of them was Chef Herbert, it was so awesome. that happend to me too! What?! Psh, when you buy card jitsu WATER you expect to jump a level in WATER! That's not fair! Yeah Mimo. Same thing happened to me. I'm really getting sick of club penguin screwing us, frist when your trying to get the water helmet you only get one point each time you win. if you dont feeze or lag. This is just bs. Then the multi window bug that takes all the things you earned away. I saw you on club penguin about an hour ago in the water dojo. I tried to send you a post card but it said your mail was full. Can you meet me on club penguin now in the water dojo on mountain? Thanks. This is DEFINITELY not fair! I can't believe they can make such a thing! Advance a fire level? Are they serious? In a water pack? Sheesh! I'M A WATER NINJA! I BEAT IT! Lol sorry about the caps I'm just psyched that I beat it the day it came out. It took my 6 hours though. Lol I forgot to tell you. When you dance, these waves swirl around you. When you wave, a cloud appears, it rains, and you disappear. Its so coll! Mimo, I found a cheat. The new stamps for CJ and CJF such as the belts and outfits can be earned by playing sensei once. Gove Credit to Braceface27. If you put on your ninga suit and the cloud wave bracers and dissapear you will see your penguin without it for a second and then the suit comes back on and then you dissapear. This glitch happened last year,then it was fixed, and now it is back. Try it yourself. Thanks. Please give me credit. ...looks like i was late. On the start page, instead of an EPF agent, there is a ninja with a water balloon! Coolio! mimo- when are we gonna find out who wins the pins? strange. well ym brother just lost ALL his online cards and i have no idea why. he logged on to enter his water code and he was excited about the cards but then his cards went from98 to thirty! I hope this is just a bug cuz i feel so sorry for him. Something has to be done to stop this. Club Penguin would be nothing with out us...THE PAYING CUSTOMERS...Ive emailed them over and over again and they dont care. They say there working on the problem and they are aware. This is out of control. Really? I'm only on my Wave Sandals! hey guys try pressing the + button on your keyboard it makes thing a little fuzzy but it doesnt freeze at all! OMG i was playing card jitsu water then all of a sudden i turned grey! and all the cards colors got messed up! maybe cj water is messing up club penguin?! Mimo777, notice THIS. in the ninja hideout, the FIRE element is glowing on the floor. When Card jitsu fire came out, fire glowed. Why is water glowing? That is a funny thing you talked about this because i did the same thing you did when i got the mask and it didnt work. I was so mad and emailed club penguin. I am waiting for a email back. I hope it works for all of us. Mimo have you heard of someone called Ninja O Dark he is supposed to be a new famous guy coming soon? Well, it is awesome, but i think it would be better if it was a little easier. But I'm getting better at it then when I started. Although I rang the thong only once. Thanks CP for the awesome game! i found somthing weird and i have a screen shot of it how do i contact u? THE NEW CARD JITSU CARD IS OUT! then the floor goes up! then you fall down on your face, EPIC! Happy thanksgiving guys! Im almost a water ninja only 40 percent away till I challenge sensei!!! Ps i also got an acount and its name is water sensei! But why is everything for members? i had about 63 cards and when i added the new cards my card count somehow dropped to 23! Is this a bug or is cp scmamming us? It doesn't need to be against Sensei! You can play against anyone. Even if you quit in the middle of the game! MIMO i discovered something click on senseis amulet necklace before playing card jitsu water and youll get to see proof that card jitsu snow is coming also he says it reveals new places when complete! Hey Mimo, on the homepage, instead of there being an EPF phone beside the lighthouse, it's a water balloon. Instead of and EPF agent picking it up, a ninja picks it up. I got the golden card too. Just incase nobody bleieves me, ill prove it. It has a picture of snesei on the front and says, Clubpenguin, card-jitsu trading card game. anyway, i really didnt know what jump to level 1 meant, but now i do, i feel so stupid lol. i got 6 cards instead, but it was worth it. I got new cards 4 of them! but not with gold. Its awsome! Hey Mimo. When u become a Water Ninja, you can do a cool water move! I think they didn't make it yet but I think they will do it soon! -indiana742 P.S HAPPY THANKSGIVING! i think card jistu water is messin up cp someone should fix it!! On the homepage, the EPF phone has turned into a water balloon! Club Penguin has been really slow and my penguin freezes all the time. I check back 10 minutes later and I can't even get into the website. Cool! That card sounds awesome, I'd love too see it! I dont get wats going on.... ??? ok u got the golden card now wat?? Hey mimo when you go to clubpenguin.com the screen is that the penguins are wearing their ninja suit and where usally the EPF agent is theres a ninja grabbing a water thing!! Reason 1: They don't speak Chinese, they speak mandarin/Cantonese. Reason 2: Club Penguin told me that it had not been announced and they have no information about it and they say it would be a cool idea for MANDARIN. Reason 3: They can't change the logo to mandarin characters because it's the copyrighted logo. Reason 4: It wouldn't be in characters because they they learn Pin-yin. Awww!! Sorry to hear Mimo! Hey Anonymous! Golden Code Cards are very rare cards that appear one in 18 packs, 1 in 8 value decks, and 1 in 5 Dojo Collector Boxes. You can enter online the code that appears on the card and you can choose between skipping a level in CJ or unlocking cards. He actually IS a member now! Thank you for letting Mimo know! Maybe Mimo will post about this. i love the game to!!! In just day 2, i already have the torrent mask!!! Have any of u guys figured that yet? I found out something cool for card jitsu water! If you clicke sensei's amulet before you go into the game, he'll give you the option to learn things about the amulet! And if you click his suit, he'll give you the option to learn about his suit! Cool, huh? Because you need to be a water ninja to get that glow. Hey, question for all you mods. How can mimo become a water ninga if he doesn't have a membership. Bbninjas- if you see me can you send me a postcard? I did the same exact thing! I waited until I had the last item! So dumb! ps my party is now over thanks in my site party review coming soon! thanks for all that came! I know why the Card Jits fire stamps were released and you had to earn your coat and helmet stamp thats why it thought you were a fire ninja that needed the flippers. 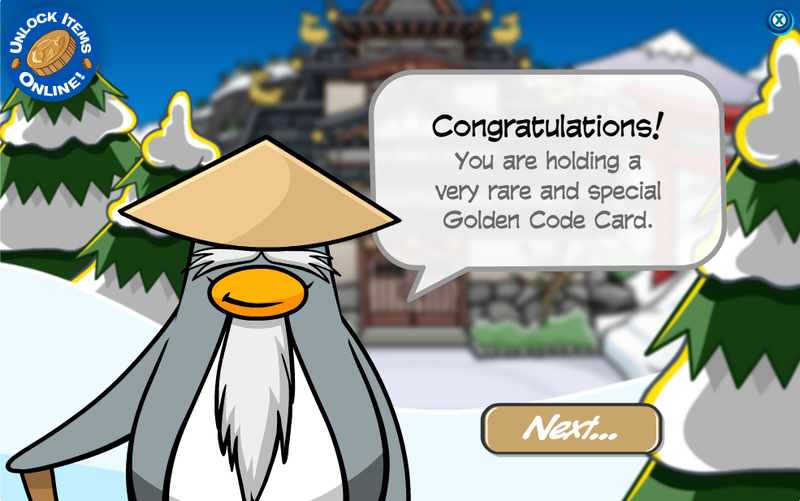 You had to play the card jitsu fire and get the coat and helmet stamp hope this helps you!